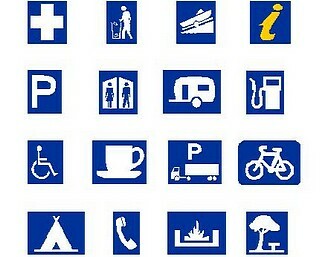 When producing a map it is important to choose mapping symbols that can be easily understood by the map reader. When using colour there are some fairly obvious conventions, particularly for topographic maps, that help to readily convey information the the map reader without them having to refer to a map legend, such as using brown for land forms, blue for hydrography, and green for vegitation. Other colour conventions include red for roads, black for man made cultural symbols such as buildings, bridges and railway lines. Topographic map legend from VicMaps. Unsealed roads and walking track are often depicted with a broken line, buildings as black square or rectangular shapes. Bodies of water are usually a screended blue infill, while rivers and streams and coastline are usually depicted with a solid blue line, intermittent streams usually as a broken blue line. 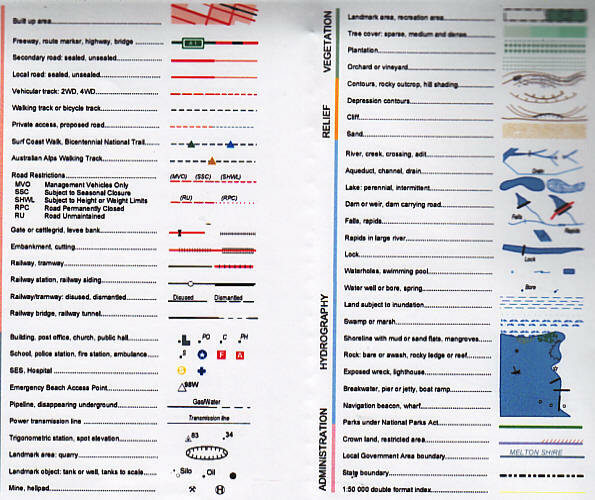 A good choice of map symbols means that the map maker can easily convey their intended message to the map reader, and the map reader can quickly find what they are looking for without too much trouble.